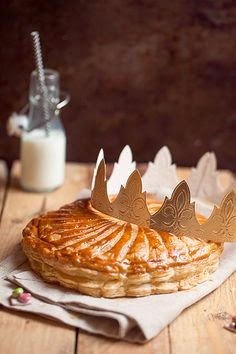 Today we will celebrate Epiphany by eating "la galette des Rois" or King's cake. The "king cake" takes its name from the biblical three kings. In Catholic liturgical tradition, the Epiphany- commemorated on January 6 - celebrates the visit of the Magi to the Christ Child. A tradition we follow back home, by eating a simple round pastry and almond paste filled cake. The tradition is to hide a small trinket like a porcelain baby or a little character (or a fava bean) into the king cake, used to represent Jesus. Today, the baby symbolizes luck and prosperity to whoever finds it in their slice of cake. In some traditions, the finder of the baby is designated “king” or “queen” for the evening by wearing a paper crown. It's a sweet and yummy tradition, we like to keep on in the house… to prolong the holiday spirit just a little longer. Recipe here :) or store bought at Paul, Gérard café and Carrefour.